Thinking you want to change the shape of your teeth? Dental contouring is also known as dental shaping and is a simple dental procedure used to help redefine the shape of one or more of your teeth. Professional dental contouring is a solution worth looking into, as changing the shape of your teeth can give you more confidence. Due to the many cosmetic dentistry advances now available, there is simply no reason for you to feel self-conscious about the shape of your teeth. Know that your oral health needs to be in good condition before a dentist will perform any tooth-reshaping services for you. While the shape of our teeth is, for the most part, related to genetics, a tooth’s shape can also be altered due to everyday living, i.e., chips and breaks. The shape of someone’s teeth is not only aesthetically important, but when teeth are not in their correct shape, they can also cause bad bite issues. It is necessary for teeth to be properly shaped, as the overall health of teeth is directly connected to the good overall health of one’s mouth. Dental contouring is a great choice for those who are looking to fix one or more of their minor tooth imperfections. Contouring services can fix many tooth imperfections, including chipped teeth, teeth that are overlapping, teeth that have ragged edges, teeth that are showing minor wear due to a bad bite, teeth that are pointy and teeth that are crooked and therefore not in their proper place. Dental contouring may be used with other dental procedures in order to provide a patient with the optimal results. The contouring process requires an experienced dentist to carefully sculpt the tooth using a special dental appliance. The sculpting will make the tooth more aesthetically pleasing, the goal of dental contouring. Have any contouring questions you need answered? Wondering if dental contouring is going to work for you? When you do not like the way your teeth look, then you need to find a solution that will work for you. Due to today’s modern advances in cosmetic dentistry, there are often different solutions for every dental problem. If we can answer any questions for you, please do not hesitate to contact us. Hope to hear from you soon! 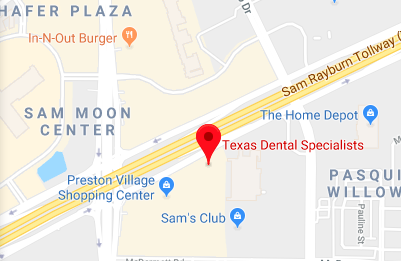 Call (214) 619-6329 today to reach Texas Dental Specialists. There is no shame in turning to a dentist for a smile makeover if you do not like the look of your teeth and/or gums. Your dentist knows exactly how to beautify your smile with one or several smile makeover treatments. Below, we provide a look at some smile makeover treatments to give you a better idea as to how we can improve your smile aesthetic. Teeth whitening is a fantastic means of brightening stained or discolored teeth. Give teeth whitening a chance and you will be pleasantly surprised with the look of your new smile. Your lovely white teeth will give you the confidence you need to smile widely in front of others and be yourself in all social settings. The best part is you will not have to spend hour after hour, day after day applying at-home teeth whitening products. We can improve the color of your teeth in about an hour at our office. Porcelain veneers conceal all sorts of imperfections. If you have cracked, chipped, misaligned, uneven or stained teeth, veneers will mask these aesthetic flaws to provide lovely-looking teeth. The first step is to etch the surface of the teeth to increase surface area. It is crucial to form a stronger bond that allows the dental material to adhere properly. The next step is to attach the veneers by applying dental cement. You decide which teeth you want to cover with veneers. Whether one tooth is bothering you or if you do not like the look of several teeth, dental veneers will mask the flaws and give you the smile of your dreams. A tooth that has significant decay or damage will undoubtedly make you self-conscious about your smile. Dental crowns are one of the better smile makeover solutions for such a problem since they serve as a comfortable cap that fits directly over teeth. Once the cap conceals the damaged portion of the tooth, your smile will look quite natural. Furthermore, the dental crown safeguards the tooth against additional injury. If your smile appears smaller than you prefer, the issue is likely with your gums rather than the size of your teeth. An abundance of gum tissue will conceal portions of teeth to make you appear younger than your true age. An uneven gum line can alter your smile to the point that your teeth look unhealthy or slightly crooked. Gum recontouring removes a bit of the soft tissue to even the gums and provide a beautiful symmetrical smile. Dental bonding treats all sorts of aesthetic problems with the teeth. This smile makeover treatment is the perfect solution for stained, chipped, misshapen, cracked or gapped teeth. We can even consider adding dental resin to your teeth to match the material to the hue of your natural teeth. We can sculpt the resin so it appears perfectly natural and conceals cosmetic blemishes. After, we will harden the material with a specialized curing light. The dentist then trims away the remaining material and polishes the teeth. For more information or to schedule an appointment with us, give us a call today.